This is definitely not one of Santiago more popular views... Smog is a big problem in our capital. This picture was taken during a hot sunday in a hiking trip to the Manquehue hill. 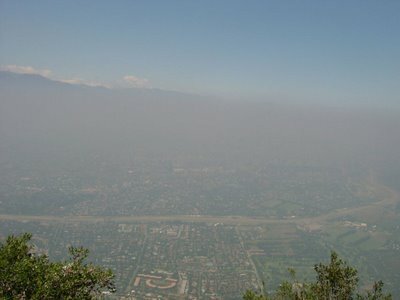 Do you have similar problems with air pollution in your cities? "FOG" le film de John Carpenter. Oui a Paris, on rencontre le meme probleme de polution des qu'il fait chaud, et comme il n'y a pas de vent dans Paris, cela pose des problemes (On a meme prevu de pouvoir interdire les voitures avec plaques paires ou impaires de rouler). Good photo that shows the problem. We don't have too much smog- not such a big population as Santiago, and we also have lots of wind- it helps to blow it away! Yes, we do too. San Francisco is a few miles away from us and it deals with smog too. Fortunately, the fog and ocean breezes scrub the air clean often. Its like we have our own air conditioning year around.